A rectangular ink cake, Qianlong period (1736-1795) dated 1739. An upright rectangular partially used ink cake moulded with a scene of an opening in a wall with a balustrade above, a flight of steps to one side and a tall tree to the other. 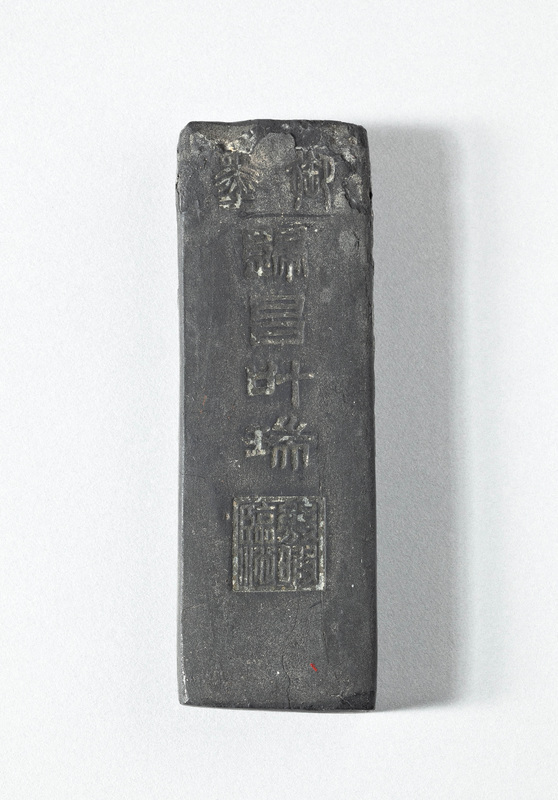 The reverse with a two character inscription to the upper register Yu mo 御墨 read as “Ink for imperial use”, the middle register with four characters Gui chang ye rui歸昌叶瑞 read as “Cries of assembled phoenixes above auspicious leaves” and the lowest register bearing the seal Jixia linzuo 幾暇臨作 read as “Copied during leisure from responsibilities”. The right hand edge has the five-character inscription, very worn in parts Qianlong sannian zhi乾隆三年製 read as “Manufactured in the third year of the Qianlong reign”. 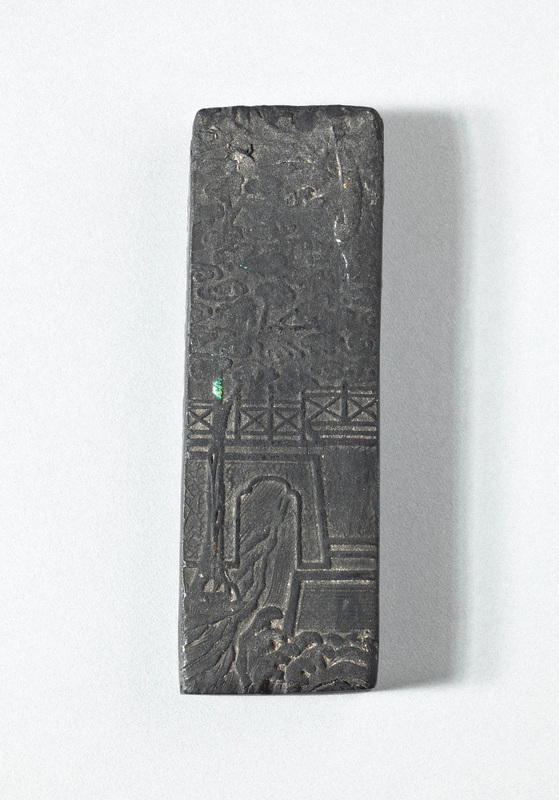 Qing dynasty, Qianlong period (1736-1795) dated 1739. 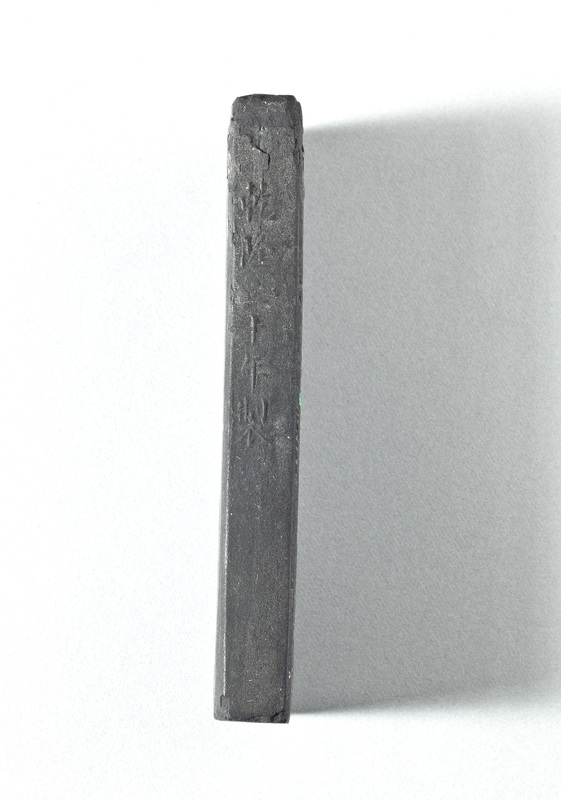 Other examples of ink cakes that bear similar inscriptions use the character造rather than the製 character found here. The seal on the recto of the ink is a reference to the Emperor Kangxi’s treatise on science, technology and culture, the Jixia gewu bian, 幾暇格物變 (Writings during leisure on the investigation of things). Click on small image above to enlarge.